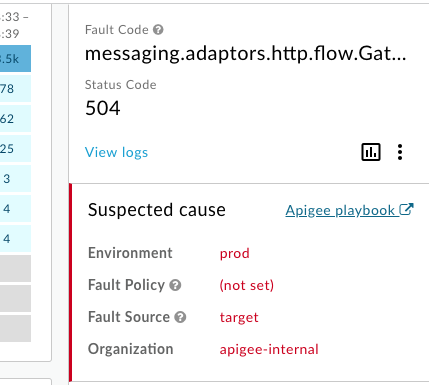 On Wednesday, January 23, 2019 we began releasing a new version of Apigee API Monitoring for Public Cloud. See About release numbering to understand how you can figure it out by comparing release numbers. The following new features were added to this release. If you filter data in the Latency dashboard by a specific time and duration, and then open the logs from the Latency dashboard, the logs are now shown for the same time and duration filter. See Use the Latency dashboard for more. When viewing metric details for either status codes or latency, the response time is now shown in milliseconds, instead of seconds. The API Monitoring UI used various terms to describe an HTTP status (HTTP Status, Response Status, Status Code, Code, Status). The UI has now standardized on using "Status Code". On the Investigate page, if you selected a value other than All (Status Code page) or Top 10 (Latency page) in the drop-down, you could not reselect it. On expanding logs inside the log panel, response time is now displayed in milliseconds instead of seconds. API Monitoring does not record target log data. Therefore, the view logs options has been removed for Targets on the Latency page. API Monitoring now generates correct filters on custom reports generated from the Latency page.